Fáilte go suíomh gréasáin Gaelscoil Dr. Uí Shúilleabháin, An Sciobairín. 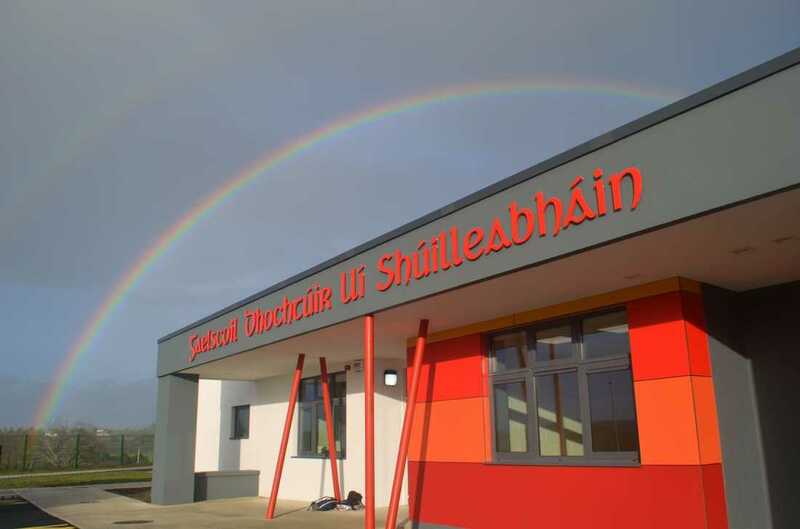 Welcome to the school website of Gaelscoil Dr. Uí Shúilleabháin. We are an Irish medium Gaelscoil located in the town of Skibbereen, West Cork. Tá súil agam go mbainfidh sibh taitneamh agus tairbhe as ár suíomh gréasáin. Is suíomh é seo do gach duine idir clann agus cairde, gar agus I bhfad ón scoil. Faigh amach stair na scoile agus eolas eile faoin scoil anseo. Féach tríd an gailearaí agus feicfidh tú na páistí gnóthach agus iad I mbun réimse leathan gníomhachtaí. Tá leathanach ag gach múinteoir agus feicfidh tú cad atá ar siúl sna ranganna ó sheachtain go seachtain. Is féidir le tuismitheoirí a bheith suas chun dáta le polasaithe agus nuachtlitreacha na scoile chomh maith. I hope you will enjoy looking through the website. This is a site for all family and friends of the Gaelscoil, near and far away. It’s a chance for everyone to learn more about the school both past and present on our information page. Check out our gallery showing our children busily engaging in a wide range of activities. Each teacher has their own page which they will update regularly. Parents can stay updated with current school policies and newsletters each week. Creidimid nach bhfuil éinne chomh tábhachtach le do pháiste. Tá gach páiste uathúil agus luachrach. Déanfaimid gach iarracht go mbainfidh gach páiste amach a gcumas/a phoitéinsiúil go hoideachasúil, go intleachtúil, go morálta, go mothúchánach agus go spioradúil. Téigh I dteagmháil linn má bhíonn ceisteanna agaibh. Beidh mé saor agus toilteanach bualadh le éinne ag aon am cuí. There is no one more important than your child. We realise that every child is unique and valued. We strive to help every child develop to his/her full potential intellectually, educationally, morally, emotionally and spiritually. Please contact the school should you have any questions. I will always be available to talk/meet prospective parents and answer your queries. Is féidir leat ár mbileog 2018/2019 a íoslódáil anseo. You can download our 2018/2019 brochure here.